Stefanie Jegelka, an ICSI affiliate, and Jeff Bilmes, an ICSI alum, were co-authors of a paper that won a best paper award at the International Conference on Machine Learning (ICML). Jegelka is a postdoctoral fellow at UC Berkeley and is affiliated with Vision. She helped organize a workshop, "Submodularity in Machine Learning - New Direction," at ICML. Bilmes, a professor at the University of Washington, Seattle, was a graduate student in the Speech Group under Professor Nelson Morgan. The award-winning paper, "Fast Semidifferential-Based Submodular Fuction Optimization," included Rishabh Iyer of the University of Washington, Seattle as a co-author. ICML was held June 16-21 in Atlanta, Georgia. Vision Research Director Trevor Darrell co-authored a paper that won a Best Cognitive Robotics Paper Award at IEEE International Conference on Robotics and Automation, held in Karlsruhe, Germany in May. 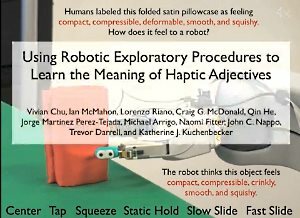 In that paper, researchers showed that it was possible for a robot equipped with tactile sensors to touch an object and describe the way it feels in the same terms that a human would use. Watch a video of the robot they worked with.